Read and download the document here. For the working age population in the UK, musculoskeletal and mental health conditions are the most common health conditions. 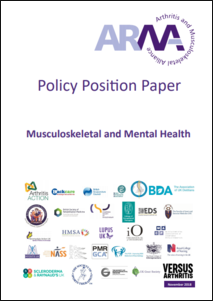 Please take the time to read our Policy Position Paper: Musculoskeletal and Mental Health document. The MSK Knowledge Hub is a searchable resource library for those working to support people with musculoskeletal conditions. Part of the partnership between ARMA and NHS England, the Hub will allow the MSK community to debate innovative ideas and good practice, share resources, network and celebrate success. This knowledge base is aimed at professionals, not patients, and is free for anyone to search. If you have musculoskeletal-related articles or documents you’d like to share – and they meet our criteria – please register with the Hub and then ‘Submit a Resource’. Once registered you can also access the interactive MSK Forum enabling people to discuss and share views. This is a new framework (launched 31/07/2018) aimed at practitioners who will be the first point of contact for adults presenting with undiagnosed MSK conditions. The Musculoskeletal Core Capabilities Framework sets out the essential skills and knowledge necessary for staff with a role as a first point of contact in different types of service provision and settings, and will provide healthcare services with clear steps and actions to support local health economies, improving service delivery and patient outcomes.Read more about the Musculoskeletal Core Capabilities Framework. ARMA policy teams and CEOs have collaborated to agree a Policy Position Paper on Supported Self-Management for People with Arthritis and Musculoskeletal Conditions. The Policy Position Paper sets out recommendations for change. 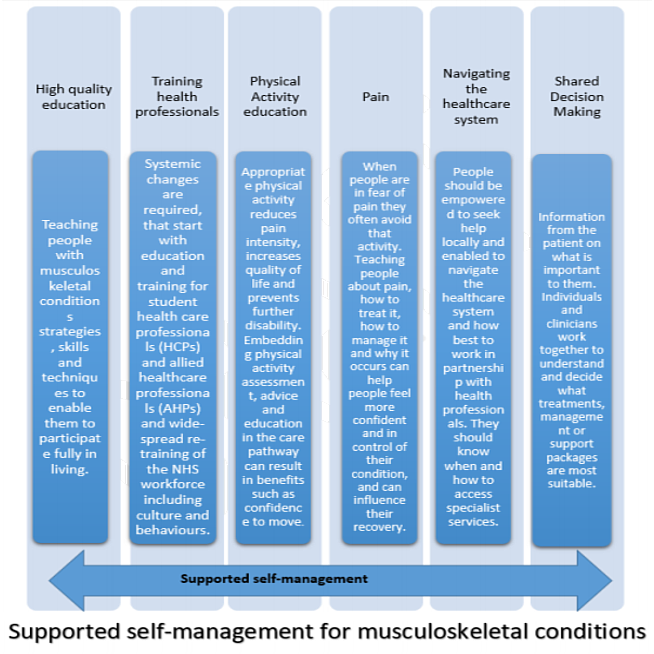 Please take the time to read our Supported Self-Management for People with Arthritis and Musculoskeletal Conditions document. The Arthritis and Musculoskeletal Alliance welcomed the announcement today of Improving Lives: the future of work, health and disability, but emphasises the need for fast progress for people with musculoskeletal conditions. Improving Lives sets out plans to transform employment prospects for disabled people and those with long term health conditions over the next 10 years. Conditions of the bones, joints muscles – musculoskeletal conditions – are the leading cause of people’s inability to work and disability in the UK. Less than two-thirds of working age people with a musculoskeletal condition are in work. Sue Brown, chief executive of ARMA said, “I very much welcome the Government’s firm recognition of the need to address musculoskeletal conditions and work. We look forward to working closely with Government to ensure the details are right, but it’s vital that there is rapid progress if we are to curb the growing impact of musculoskeletal conditions on people’s working lives. Over 6.3 million adults aged 40 to 60 do not achieve 10 minutes of continuous brisk walking over the course of a month and are missing out on important health benefits. 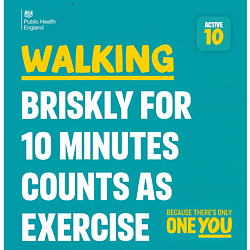 The new One You physical activity campaign is encouraging adults to build 10 minutes continuous brisk walking into their day as a simple way to improve their health, which could save the NHS over £0.9 billion per year. Read the evidence reviewed by Public Health England and learn about the Active 10 app. ARMA highlights a need for transformation so that Care and Public Health systems go beyond merely tackling musculoskeletal conditions when they arise, to promoting good, lifelong musculoskeletal health. 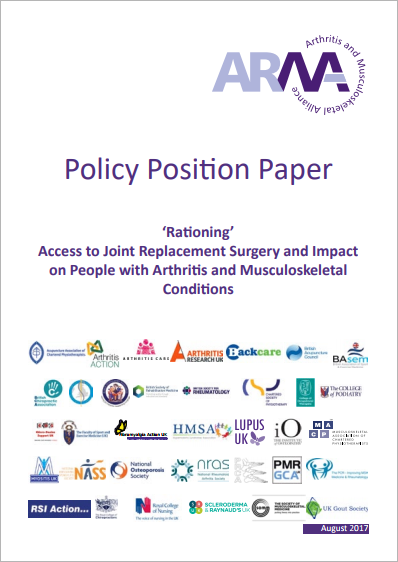 The Arthritis and Musculoskeletal Alliance is extremely concerned about increasing restrictions to access NHS services for joint replacements and the impact on people with musculoskeletal conditions. Like previous documents, these are the result of input from across our membership and our community, and contain recommendations for policy makers. ARMA worked with Public Health England and Business in the Community to develop a new toolkit for employers in the workplace, which launched at the Health and Wellbeing at Work Conference in the NEC today (7 March 2017). Musculoskeletal conditions are an important consideration for businesses as they are a leading cause of pain and disability in the UK, affecting many employees. The toolkit draws together information for employers to support staff in the prevention, early identification, management and adaptation for people affected by musculoskeletal conditions. The musculoskeletal toolkit is a simple step-by-step guide dealing with back, neck, muscle and joint pain at work. It will help employers access the best free resources that are available for their organisation and employees. You can access the toolkit from the Business in the Community website. 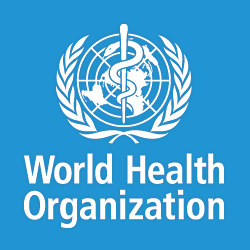 The Arthritis and Musculoskeletal Alliance, an alliance of prominent health charities, professional and research bodies, today [Thursday 15th September 2016] welcomed a ground-breaking World Health Organisation action plan to tackle musculoskeletal conditions in Europe. 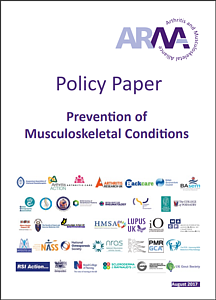 The Action Plan was also welcomed internationally by the Global Alliance for Musculoskeletal Health, calling on the European Region to implement the Action Plan and all countries of the world to adopt a similar approach to tackling musculoskeletal conditions. Sign up to the Global Alliance’s e-petition. ARMA welcomes the recognition in the Improving Lives: The Work, Health and Disability Paper of the need to address musculoskeletal conditions and work. Musculoskeletal conditions are among the commonest causes of people’s inability to work and, as evidenced in the Global Burden of Disease study (2015), are the single biggest cause of pain and disability in the UK. Less than two-thirds of working age people with musculoskeletal conditions are in work. MSK conditions are the leading cause of sickness absence, resulting in 30.6 million working days lost each year and one in five visits to the GP. They are associated with anxiety and depression. The impact of MSK problems on work is predicted to increase and with people working into older ages, the impact on work will also increase. We look forward to working with the Joint Work and Health Unit and ARMA members to provide more detailed support from the musculoskeletal community to realise the opportunities that the Green Paper proposes. 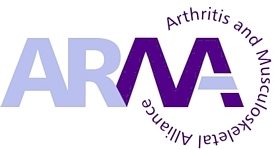 ARMA is the alliance providing a collective voice for the arthritis and musculoskeletal community in the UK. Together, ARMA and its member organisations work to improve quality of life for all those living with musculoskeletal (MSK) disorders in the UK. We aim to foster co-operation between charities and professional organisations, working to enhance understanding and mutual support between individuals and organisational bodies.